Ian and Clare joke with each other easily and obviously enjoy each other’s company. Their relationship is stronger now than when they married 12 years ago. But life has not always been plain sailing. “Like many couples who face infertility, our marriage has been tested to the limit and there were times that I thought we would not survive this experience,” says Clare candidly. Both were 30 when they eventually married. “Marriage was a natural step but we were both busy with our careers and waited until the time was right for us. We thought there was plenty of time to think about a family later on,” explains Ian. Trying for a baby straight away seemed another natural step and Clare was not too worried when nothing had happened after six months. “After a year, I started to feel uneasy and began to be aware of the phrase, ‘your biological clock is ticking’. Everyone I spoke to seem to say that…” remembers Clare. Eighteen months after their marriage, Ian and Clare underwent a series of tests to find out if there was a problem. “I was convinced by this time that everything was my fault and that my fallopian tubes were blocked or that I wasn’t producing any eggs – I had read it all up on the Internet,” says Clare. But the diagnosis surprised them both. “It was my sperm that were the problem; they were a very odd shape and they could not swim properly,” adds Ian. Having got over this shock, Ian and Clare were not unduly worried. “We talked to the consultants at the fertility clinic and were confident that a round of IVF treatment would sort us out. We knew that it didn’t work every time but we launched into the first round with great confidence,” says Ian. Neither Ian nor Clare realised that the quoted success rate of IVF treatment, around 25 per cent, meant that it never works for some couples. “We just assumed that if we had to have four rounds, so be it, we would have a baby at the end of it all,” says Clare. Sadly, this was not to be. After four unsuccessful attempts at IVF, the couple had run out of money to fund further treatments and they had run out of emotional steam. Their doctors advised against trying again, as Ian’s sperm were failing to fertilise the eggs and his sperm count was reducing all the time. “It was a completed nightmare. I was ill and tired from having the ovulation stimulation drugs and constantly being in and out of hospital. I just could not do this any more. Ian and I could barely look at each other and we were very close to splitting up and just walking away,” says Clare. After a break for six months to try to come to terms with their anger and grief, the couple was contacted again by the fertility clinic to discuss their future options. 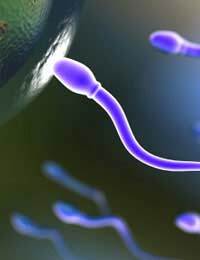 The clinic raised the possibility of using donated sperm to try to initiate a natural pregnancy. “This was an option that we could not consider before as we desperately wanted our child to be biologically linked to both of us. However, we had to face up to the fact that we were likely to be childless, and that was more painful. Using donated sperm was a chance to conceive and raise a child that would be ours in all other respects,” says Clare. After further counselling to make as sure as possible that neither had any serious issues with using donor sperm, and making a choice from different profiles of anonymous donors, the artificial insemination procedure was carried out two months later. “This time, I didn’t have to take drugs, I felt well and Ian was with me. It was a shared experience, albeit a rather strange one,” laughs Clare. Sperm donors are usually men in good physical and mental health between the age of 18 and 40 who have been screened both for sexually transmitted diseases and known genetic disorders. Their blood type, racial background and general physical appearance is described for couples or individuals requesting artificial insemination to choose a close match to the emotional father if they wish. To their complete delight, Clare became pregnant after the first insemination and the pregnancy went along with no major problems. Son Alexander was born on February 11th, Ian’s birthday and has just turned two. “To be honest, I wish that we had done this instead of all the IVF, it would caused us far less anguish, but hindsight is a wonderful thing,” says Ian.